The meta is always changing within Clash Royale and for the 14th time, we have the new best deck within Clash Royale! This deck is a giant bowler beatdown, centered around getting as many crowns as possible in Clash Royale. Here is some gameplay and strategy around the best deck in Clash Royale right now, a giant bowler deck! This deck winds up playing just like a typical giant beatdown deck. You have three main beatdown cards in the giant, bowler, and baby dragon. The giant is going to be the primary tank in this deck, soaking up the damage from any defense played and the arena tower. Also, the giant can do tons of damage if he is able to reach the tower. The bowler and baby dragon are both support damage dealers with one doing ground splash damage and the other doing air splash damage. These two cards are the best to play with your giant since they can clear large fields of troops. Despite this being a big offensive deck, you still need to play defense in order to win battles in Clash Royale. Within this giant bowler deck, you have two main defensive units with the skeletons and mega minions. 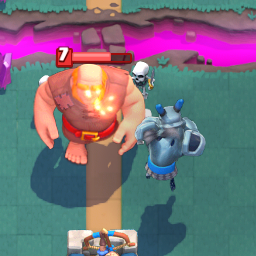 The skeletons are great at distracting and taking out cards like the mini-P.E.K.K.A., musketeer, and bandit. The mega minion offers a bit more DPS, being your real tank killer. Also, you will need the mega minion to defend against air pushes. Lastly, this beatdown deck features 3 spells. One, the log, is just a good, all-around, basic spell to include in your deck. It can damage and push away popular counters to the giant such as barbarians and skeleton army. The tornado is one of the best spells in Clash Royale right now and can be used to group opposing units for your splash damage troops to destroy all at once. Finally, every deck needs a big direct damage spell and the lightning fills that role. The lightning should be used to chip down your opponent’s tower, one zap at a time! If you can catch any one of those units, along with the opponent’s arena tower, it is a beneficial trade for you! Try to lightning your opponent’s tower at least twice during each battle for ease to destroy with your main troops. So as I have said many times through this guide, this giant bowler deck is an example of a beatdown deck within Clash Royale. This means that the deck thrives through BIG pushes, not quick, inexpensive ones. You want to build up pushes that have enough DPS to take out a tower with ease if not defended. As a rule of thumb, for every push you do with this deck, try to include at least 3 units! Having a couple of these pushes (plus lightning damage) will end up being enough to take a tower. Attempt to stage at least 3-4 big pushes throughout each battle, trying to get a two crown for each battle that you participate in. As with all giant beatdown decks in Clash Royale, offense is more of a priority than defense. You want to try to defend as cheaply as possible so that you can afford big counter pushes with a lot of elixir. For example, if a giant is heading your way, a mega minion and skeletons is more than enough to shut it down. Once your mega minion and skeletons have finished with the giant, you can pop a giant in front as a tank and put together a decent sized push from a cheap defense. Also, you’ll have enough for a lightning spell to take out any medium sized unit that your opponent may play to stop you…. cheap defense leads to great offense! LavaLoonion: Luckily, you have a ton of air defense in this deck, so defending this push isn’t really that hard. You gotta play the baby dragon to start whittling down the lava hound while your mega minion cleans up the loon. Hit a tornado to pull all of it to the center to avoid any damage! Golem Beatdown: Golem beatdown is the hardest push to defend, due to your lack of a defense in this giant bowler deck. However, you can use bowler and skeletons to defeat the golem while the baby dragons cancel each other out! Knight-Three Musketeers: Lightning is the absolute best against this combo! When you play your lightning on the musketeers, just be sure you don’t catch the knight inside the radius. Then, use skeletons to take out the knight to avoid ANY damage! Hog-Electro Wiz: Finally, we have the popular hog-electro wizard combo which is also very easy to defeat. First off, play a mega minion on the e-wiz so it can’t target two targets! Then play your bowler in front of the hog to push it away from the tower. Still not a bad troop! They were better at 4, but still good at 3. Pingback: Most Meta Deck #14: Giant Bowler Deck | Clash of Clans Guide, Strategies, Tricks and More!